If you want to impress that special someone, make them Horseradish Encrusted Grouper with Lemon Butter Sauce for their Valentine’s dinner. This is one of those recipes that impresses, but in reality is simple to prepare. 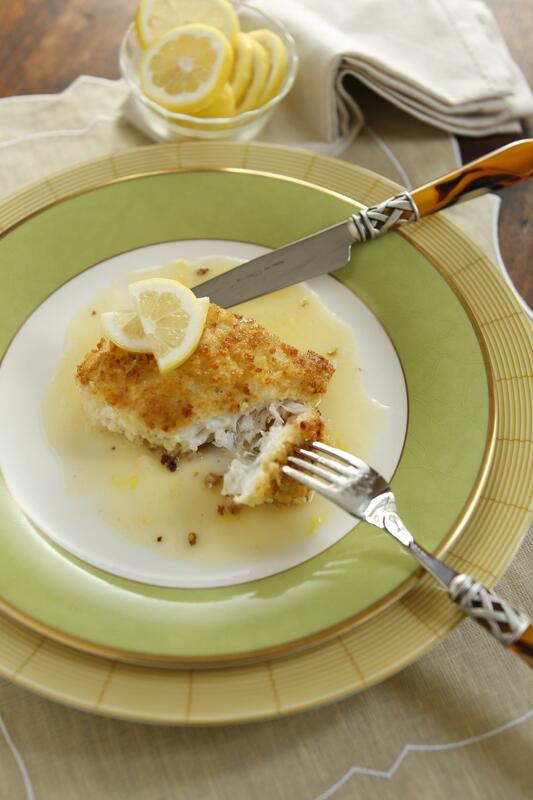 Horseradish Encrusted Grouper with Lemon Butter Sauce sounds much more difficult to make than it is. Longtime Memphians may remember this dish. For years, it was one of the most popular fish dishes in town. When Rick Farmer of the much beloved and much missed Jarrett’s Restaurant shared his recipe with me, I was shocked at how simple it was to prepare. This dish has a lovely and mild horseradish flavor that really compliments the fish. I recommend using prepared horseradish rather than fresh. Fresh horseradish has a strong, pungent flavor. When the hard white root is grated, it continues to get hotter as its volatile oils are released. The process used in “preparing” horseradish stops this reaction and stabilizes the flavor. Instead of encrusting the fish with straight horseradish, the perfectly balanced flavor in this recipe comes a horseradish-infused egg wash. The egg wash helps cut the strength of the horseradish so it doesn’t overpower the fish and also helps the crispy Panko breadcrumb crust adhere to the fish. If this recipe is a bit too mild on the horseradish for you, Rick recommends draining the prepared horseradish in a fine sieve before mixing with the eggs. I can’t remember which sauce Rick served with it, but I found a Lemon Butter Sauce really completed the dish. Just whisk together a little melted butter, freshly squeezed lemon juice, and lemon zest to bring this simple sauce together. This is Jennifer Chandler with The Weekly Dish. Happy Valentine’s Day! To prepare the fish: Place the horseradish and eggs in a shallow bowl and whisk to combine. Place the bread crumbs in another shallow bowl. Generously season the fish with salt and pepper. Dip the fish in the egg mixture to coat completely, letting the excess drip off. Then dredge the fish through the bread crumbs, evenly coating on all sides. Place the prepared fish on a baking sheet or cutting board. In a large oven-proof skillet over medium-high heat, warm the oil until a few droplets of water sizzle when carefully sprinkled in the pan. Sear the fish on one side until golden brown, about 2 to 3 minutes. Turn over the fillets and cook until the other side is golden, about 2 minutes more. Transfer the fish to the oven and cook until desired doneness, about 6 more minutes for medium. To prepare the lemon butter sauce: In a small bowl stir together the melted butter, lemon zest, and lemon juice. Season with salt and pepper to taste. To serve, spoon the sauce onto each plate and place the fish on top. Serve immediately.